David Francis Furniture offers indoor and outdoor patio seating with an elegant coastal living style that will wow your family and guests. 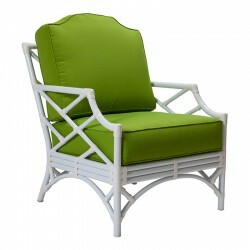 The Napa patio lounge chair is just one of the finely crafted pieces from the Napa Outdoor Furniture Collection. Offered in a white powder coated aluminum frame and a large selection of Sunbrella cushion colors, it'll be a walk on the beach to match your home or outdoor patio decor. All Napa patio lounge chairs come complete with an all weather reversible cushion and 26" throw pillow in the fabric color of your choice. Searching for the perfect color match? Request a swatch! We will gladly send one out to you. All David Francis' Sunbrella upholstery options are available for order. W34" x D27" x H35"
Product Cover (Upholstery Material or Type of Metal) Sunbrella® (solution dyed acrylic fabric) reversible cushion. Available in any of David Francis' Sunbrella upholstery options. Includes 26" throw pillow. Shipping Free Shipping Everyday. Please allow up to 4-5 weeks for delivery. Due to the nature of the item, returns cannot be accepted. Round Drop In Fire Pit Pan - Stainless Steel - 19"